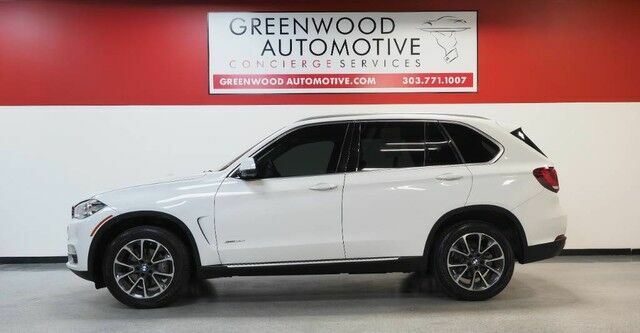 This outstanding example of a 2017 BMW X5 xDrive35i is offered by Greenwood Automotive. When you purchase a vehicle with the CARFAX Buyback Guarantee, you're getting what you paid for. With this exceptional SUV, you'll get "sport," "utility," and comfort. You deserve a vehicle designed for higher expectations. This BMW X5 delivers with a luxurious, well-appointed interior and world-class engineering. All-wheel drive means peace of mind all the time. This White AWD BMW enjoys a host offeatures, including exceptional acceleration and superior stability so you can drive with confidence. The X5 xDrive35i is well maintained and has just 30,286mi. This low amount of miles makes this vehicle incomparable to the competition. Take the guesswork out of where you are going with the top-tier navigation system found on this exceptional BMW X5. This gently driven vehicle has been well-kept and still has the showroom shine. Intricately stitched leather and ergonomic design seats are among the details in which test drivers say that BMW X5 is in a league of its own More information about the 2017 BMW X5: BMW's X5 offers seating for seven with high-tech on- and off-road capabilities. With great styling as well as a host of refinements throughout its development, the package is hard to ignore. Although it ranks among the more expensive SUVs in its class, it's a strong competitor, offering a wide range of options not found on the Acura MDX, Lexus RX 350 or Mercedes M-Class. The X5 M competes with the top-of-the-line GL-Class from Mercedes and the Cayenne GTS from Porsche. The BMW offers intense performance for less money than either without giving up comfort and capability both on- and off-road. WWW.GREENWOODAUTOMOTIVE.COM for all Photos Our Dealer Handling fee of $499 is included in our advertised price. Government fee's and licensing are additional costs. For best service and to check availability or to set an appointment to see and drive call Steve direct at 720-339-1516 or Marc at 303-552-7909 For more information. FINANCING AVAILABLE. TRADES WELCOME. *VEHICLE IS FULLY INSPECTED BY OUR MECHANIC. We are located 4 Blocks West of I-25 on North side Of Arapahoe, Behind US Bank at Syracuse St.